Many people think that all black and white cats are tuxedo cats. But that is not accurate. Tuxedo cats should have a coat of solid black throughout most of their bodies, with white fur only occurring on their belly, chest, face/chin, and paws. The cow cat. The so-called "cow cat" (also known as "moo cat" pattern). These cats have a similar pattern to that of Holstein cattle. 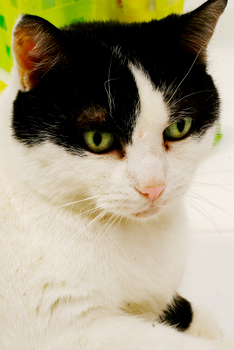 The cow cat shows large patches of black over mostly solid white fur. The black mask. This type of black and white cat looks like she is wearing a black mask over her head, hence the name. These cats may have a predominantly white body. Mask and mantle cat. As the name suggests, this cat appears as though she is wearing a black mask and manle over mostly white fur. Cap and saddle. These cats look as if they’re wearing a cap on their head. They also have a large patch on their backs. Again, these cats are mostly white. Black and white felines are also known as magpie or piebald cats. Tuxedo cats are also called billicats. Tuxedo cats are not a cat breed. Are you looking for cat gifts, do you love cat pictures? Consider giving pictures of black and white kittens and cats. Below you will find several lovely pictures of bicolor felines. These pictures are brought to you in affiliation with AllPosters.com. In addition to pictures, you will find other items showcasing black and white cats, including: calendars, photos, clothing items, and much more. Needless to say, these articles make terrific cat lover gifts. All about tuxedo cats. - Learn more about these elegant cats. Pictures of tuxedo kittens. - A mini gallery of sweet bicolor kittens. Names for tuxedo felines. - Looking for a name for a tuxedo kitty? Here are some ideas. Tuxedo cat gifts. - Gifts for tuxedo cat lovers.